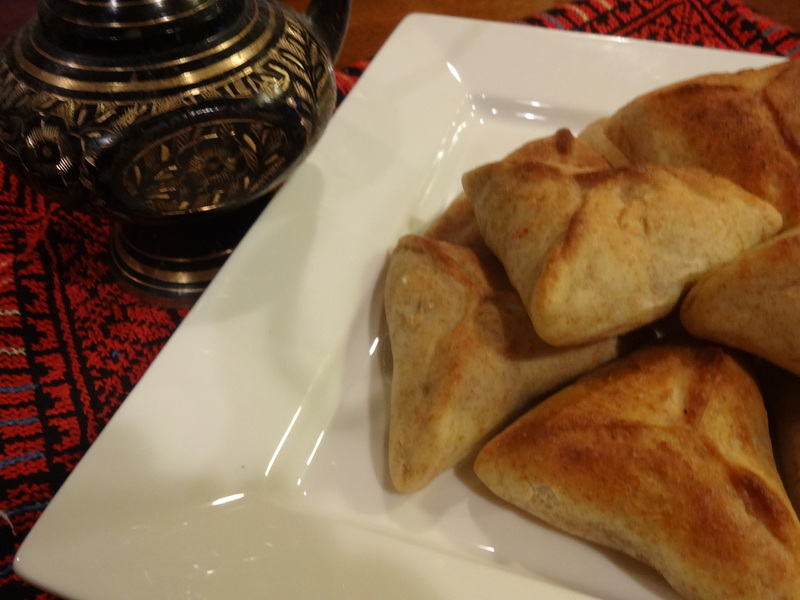 Fatayer Sabanekh are triangle-shaped, golden pastries filled with fresh cut spinach, onions, and spices. This is one of our favorite spring recipes. Spinach season in Palestine starts in the early spring and runs through late summer, so eating these always reminds us of nicer weather – something we are really missing right now in Seattle. The neat, little triangles are a great addition to any party spread, and also make great appetizers. Sumac is used to give the filling a little zing, and is another spice you should pick up at the Arabic store! It’s definitely a pantry staple for us, so expect to see it make frequent appearances. You can use spinach from your garden or the grocery store. We’ve found that a Costco bag of baby spinach is exactly the right amount for one batch. The same dough in this recipe can be used to make other fatayer (pastries) as well. Once you get the hang of making the dough, it’s pretty easy to whip up, and you can get creative with your fillings. If you don’t use the all of the dough, it can be frozen, or put it in the refrigerator to be used in the next couple of days. 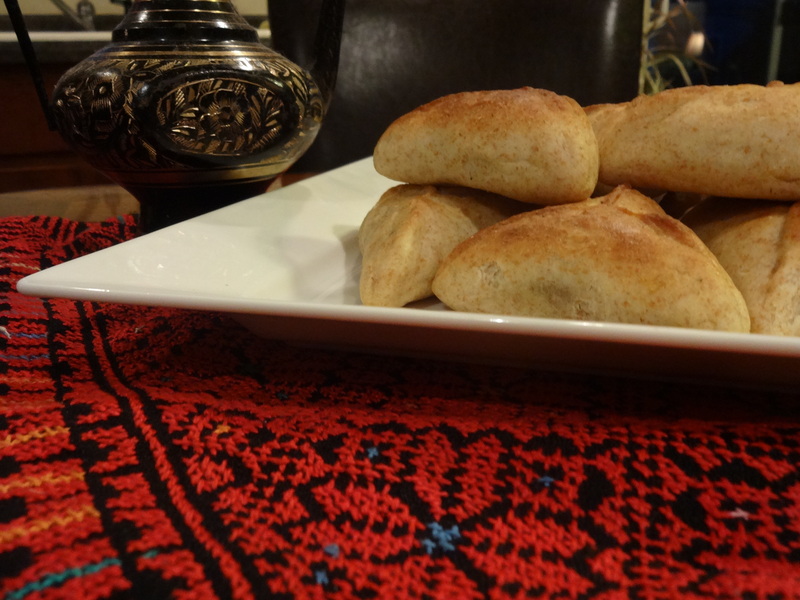 Give fatayer sabanekh a try and let us know how you like it! Sahtain! Mix yeast, sugar and 1 cup of warm water and let it sit until the yeast is dissolved. In the meanwhile, in a large bowl, mix the flour, yogurt, olive oil, and salt. Add the dissolved yeast and 1 cup of water. Mix and knead with your hands until the dough is smooth and elastic. If the dough is a little dry you can add some water until you feel it is smooth. If you have an electric mixer follow the same steps, and then mix for around 10 minutes. Cover the dough in a bowl with plastic wrap and set it a side at room temperature until it rises (about an hour). It should almost double in size. Chop the spinach, add salt, and leave it for 10 min to release excess water. Squeeze (and we mean squeeze) the spinach to get rid of any extra water. Add the onion, cumin, sumac and oil to the spinach and mix it well. Cut the dough into small ping-poing sized balls. Spread the dough ball flat with your fingers or use a rolling pin. Put 1 Tblsp. of filling in the middle of the dough. Close the dough around the filling to make a triangle shape. Squeeze all the edges firmly so it won’t open while baking (if the filling is too wet, the edges will also open, so again, squeeze that spinach!). Arrange the triangles on a baking sheet. Place the baking sheet on the lower rack of the oven, baking for 10 minutes or until the bottom has a golden color. Transfer the baking sheet in the upper rack of the oven to toast the top side of the dough for 1-2 minutes.